Plantar fasciitis causes pain under your heel. It usually goes in time. Treatment may speed up recovery. Treatment includes rest, good footwear, heel pads, painkillers, and exercises. A steroid injection or other treatments may be used in more severe cases. Plantar fasciitis means inflammation of your plantar fascia. Your plantar fascia is a strong band of tissue (like a ligament) that stretches from your heel to your middle foot bones. It supports the arch of your foot and also acts as a shock-absorber in your foot. When a patient has plantar fasciitis, the connective tissue that forms the arch of the foot becomes inflamed (tendonitis) and degenerative (tendinosis)–these abnormalities cause plantar fasciitis and can make normal activities quite painful. Symptoms of plantar fasciitis are typically worsened early in the morning after sleep. At that time, the arch tissue is tight and simple movements stretch the contracted tissue. As you begin to loosen the foot, the pain usually subsides, but often returns with prolonged standing or walking. Factors which may contribute to plantar fasciitis and heel spurs include a sudden increase in daily activities, increase in weight, or a change of shoes or allowing your current shoes to wear excessively. Shoes that are too flexible in the middle of the arch or shoes that bend before the toe joints will cause an increase in tension in the plantar fascia. Make sure your shoes are not excessively worn and that they do not bend in the “middle of the arch”. Most health care providers agree that initial treatment for plantar fasciitis should be quite conservative. You’ll probably be advised to avoid any exercise that is making your pain worse. Your doctor may also advise one or more of these treatment options. A heel pad. In plantar fasciitis, a heel pad is sometimes used to cushion the painful heel if you spend a great deal of time on your feet on hard surfaces. Also, over-the-counter or custom-made orthotics, which fit inside your shoes, may be constructed to address specific imbalances you may have with foot placement or gait. Stretching: Stretching exercises performed three to five times a day can help elongate the heel cord. Ice: You may be advised to apply ice packs to your heel or to use an ice block to massage the plantar fascia before going to bed each night. Pain relievers: Simple over-the-counter nonsteroidal anti-inflammatory drugs (NSAIDs), such as ibuprofen, are often helpful in decreasing inflammation and pain. If you have stomach trouble from such drugs, your health care provider may prescribe an alternative. 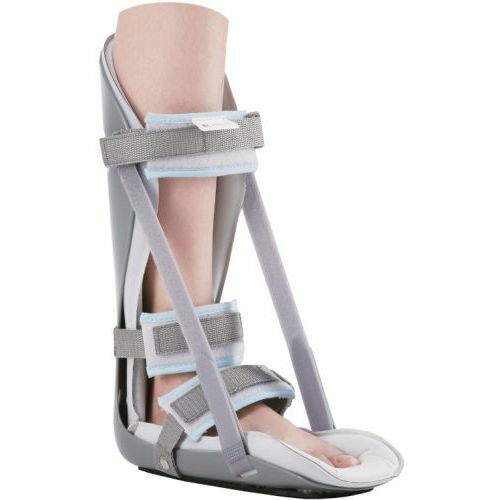 A night splint: A night splint is sometimes used to hold your foot at a specific angle, which prevents the plantar fascia from shortening during sleep. Ultrasound: Ultrasound therapy can be performed to decrease inflammation and aid healing. Steroid injections: Anti-inflammatory steroid injections directly into the tissue around your heel may be temporarily helpful. However, if these injections are used too many times, you may suffer other complications, such as shrinking of the fat pad of your heel, which you need for insulation. Loss of the fat pad could actually increase your pain, or could even rupture the plantar fascia in rare cases. Walking cast: In cases of long-term plantar fasciitis unresponsive to usual treatments, your doctor may recommend that you wear a short walking cast for about three weeks. This ensures that your foot is held in a position that allows the plantar fascia to heal in a stretched, rather than shortened, position. Shock wave therapy, Extracorporeal shock wave therapy which may be prescribed prior to considering surgery if your symptoms have persisted for more than six months. This treatment does not involve any actual incisions being made rather it uses a high intensity shock wave to stimulate healing of the plantar fascia. If your first step in the morning often feels like it involves a rusty nail being inserted into your heel, you’re not alone. Heel pain resulting from plantar fasciitis is the most prevalent condition treated in podiatric clinics, and an additional 1 million Americans annually are seen by medical doctors for the condition, according to the Centers for Disease Control and Prevention. The plantar fascia is the ligament that runs from the heel bone across the entire bottom of the foot and connects at the base of the toes. Ligaments connect bone to bone, and don’t really constrict or contract, but can become thickened because of inflammation. Inflammation of the plantar fascia can cause strain when you walk, specifically heel pain that is especially bad for the first few steps after prolonged inactivity. It then typically loosens up once you’re up and about.